This was finally the year that exposed just how fragmented our sources of news, information, and entertainment have become. And it’s going to be extremely hard to put audiences back together to form one or two mass mediums of distribution — just ask the “media,” who fully lost hold of a broad audience during this year’s presidential election. Reaching an audience enmeshed and attuned to the topics, formats, and/or sensibilities that creators have previously sublimated to favor broad appeal will present a new opportunity to creators. And the way we think (and track) those audiences has to change to ensure that we’re making content discoverable to as many people as possible (through ad-supported, freemium models, for example), so that we can use that relationship to push super-users into a high-touch, high-margin experiences. What are those high-margin experiences? As someone who spent spare time in 2016 launching a print-only magazine, I’m a big believer in the prospect of indie publications to connect with specific audiences and charge a premium for an exemplary experience. What we’re doing at Racquet — identifying a niche audience centered around highbrow tennis culture and providing a premium experience at a premium price — tracks with what I do in my day job at Acast — working with independent producers and media companies to attract and grow high-value audio products with high CPMs to match to reach more engaged audience. Live events, newsletters, merch — even wine clubs — round out the mix for publishers looking to expand a footprint in one medium and open the door for super-users to a premium environment where they can better control and monetize the experience. Our magazine efforts join a long-established community of Indie publishers, but increasingly we’ll see other creators venture into print to create a splashy, high-touch offering. Matter Studios put out a print accompaniment to its Total Power Move event in November, and the e-commerce mavens behind Of A Kind capped off the year by releasing Kind of a Mag, a new foray into a very old and beloved medium. Watch out for many more in 2017. To better accommodate a world where individual media consumption is fragmented into a collection of personalized niche topics, recommendations, integrations, and connectivity will become more important than ever. Any media company who can anticipate where their audience is likely to be and how they’re likely to consume content can expect to make huge gains in the current media landscape. My former employer, The Washington Post Co., is a great example of how a fully integrated media company could function. Amazon Prime purchases can fuel recommendations for print products and digital subscriptions; data provided by on-demand audio delivered by Alexa and funneled back into Amazon and Audible to determine the slate of releases for the next season of programming. To accompany this, we’re likely to see a return to the studio model, where IP is the most valuable asset a media company or an independent producer can leverage. News and entertainment have merged to create “content,” but while the election revealed that broadcasting to a giant unified audience might not be recoverable, recommendations and empowering a niche audience can help free news to be news again. With the prospect of a post-fact political climate defining our next four years, speaking truth to power has never felt more necessary or patriotic as it does now, and the amount of Americans willing to spend or donate money to support quality journalism has proven encouragingly high; see the soaring subscription rates to The New York Times, The Atlantic, and the Washington Post as well as increased donations to ProPublica and Mother Jones. This frees news to unshackle itself from polls, clickbait, punditry that defined (and saw declining audience in) the past two decades and to shift towards investigations, FOIA requests, policy analysis, and legislative scrutiny. What better outcome for this new cycle’s shortcomings than to pave the way for shoe-leather reporting, reporting, reporting that could reboot our entire industry. 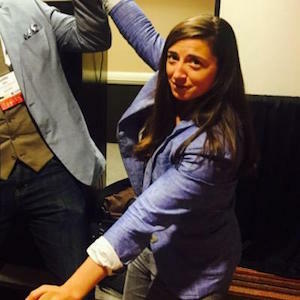 Caitlin Thompson is director of U.S. content for Acast and publisher of Racquet magazine. Dec. 13, 2016, 4:19 p.m.